Windows 10 is shipped with an intelligent personal assistant known as Cortana. You can interact with Cortana through voice commands with the [Windows] + [C] key combo or by clicking in the Search field. However, if you don’t feel like using any of the above methods, you can always create a Cortana shortcut on your desktop. This article will guide you through the different steps involved in the creation of a desktop shortcut for Cortana. N.B. 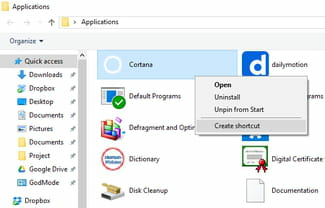 Head back to the Application folder to create desktop shortcuts for other programs, tools, or settings. Published by jak58. Latest update on October 31, 2016 at 09:20 AM by Olivia Long. This document, titled "How To Add Cortana to Your Desktop," is available under the Creative Commons license. Any copy, reuse, or modification of the content should be sufficiently credited to CCM (https://ccm.net/).